It’s way late in the day before a long weekend, but just to jog some notes down to pick up next week. Besides spawning an Ontario Extend Daily Extend challenge for July I have more plans for the month. Participants in the first cohort training were set up with web domains with Reclaim Hosting sponsored by the project. It was a lot of things covered in the face to face sessions, and we just barely got into the essentials of domain management, written up as a guide. As anyone who has first glanced at the cpanel dashboard, the array of icons is overwhelming. I’m planning on a four week series of activities, exercises to provide a group of people an experience together, and a place to gather around. Reclaim Hosting supports a large number of educators with their domains, and while they have a community area, with great responses in questions asked, and a lot of documentation, my hunch is most people miss the space. I had suggested, and they put in place a “Newbies Corner” where I have been putting out a first few queries of interest in participating in “domain camp”. Here we can “extend” Ontario extend to reach a larger community. So a bit of camp activity, discussion, announcement will take place here. It’s also in my thinking to create a series of activities for campers within the Activity Bank used so far for exercises in response to the Ontario Extend modules. This works well for sharing, as people will be publishing new sites and content pn their own domain. But it was also reading Tim Clarke’s great ideas shared as a response in the Reclaim Hosting Community that got me thinking a big part of this could be people like Tim, who have expertise, to add activity ideas to the bank. That’s how the bank was designed. Week of July 9 Meeting cpanel, creating a simple landing page with Site Builder (which most people will want to change), using the Reclaim Community, and introduction to the File Manager. Week of July 16 Creating subdomains, installing apps/sites into subdomains vs directories, setting up a Camp blog with WordPress, using web redirects. Week of July 23 Installing a better landing page with a wordpress theme (or something else), setting up domain email and email forwarders. A Monday or Tuesday live video demo session, demonstrating the techniques, tools used that week. It will be archived, and posted in the same places as above. A call for more experienced Domains people to add more activities to the bank. Drop in live office hours maybe on Thursday. These are just some notes transferred from my sketch pad to the blog. 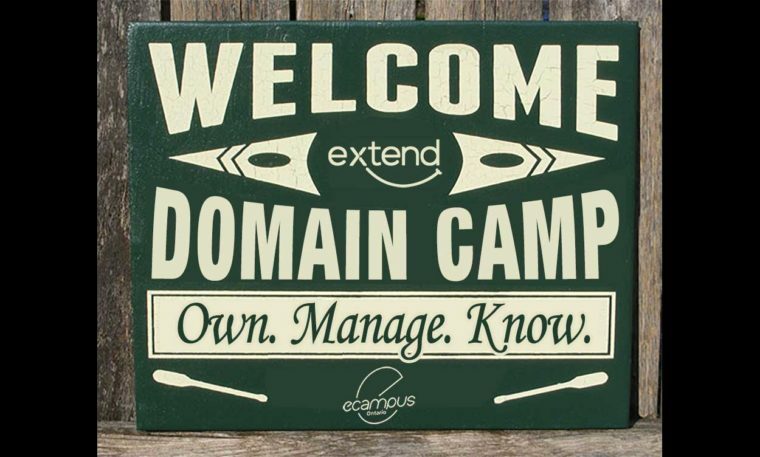 I’m thinking that the camp experience would definitely be aimed at people doing their first experience with a domain, but also designed for people who have had their domain for a while but would like to dive in a bit deeper. And this will be a wide open experience for anyone with a new or existing domain to join, definitely anyone who has gotten a domain through Ontario Extend. We do have some more accounts available we can share with participants who have progressed through or are making steady progress though the Ontario Extend Modules. So if you have been using hosted blogs for your Ontario Extend work and wish to explore what more you can do when you reclaim that to a plot of internet land of your own, please let me know. For now, Domain Camp is a graphic and these ideas, I’d certainly like to hear your ideas on how to help people learn their domain landscape. Please comment here or in the Reclaim Hosting Community thread where I started the idea rolling.